This week's photo is today's lunch that had me oohing and aahing. As some of you might now, my husband is a chef and he spoils me rotten with delicious food. I wish that my photos could convey how good his food really is. I guess that is partly why I have such a big interest in food photography. 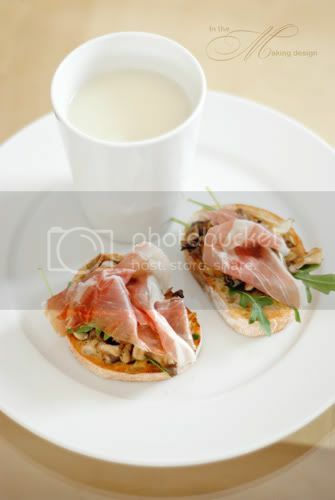 Today the lunch consisted of a soup of sunchoke (or Jerusalem artichoke) and crostini with mushroom and prosciutto. And not to disappoint, dinner tonight will be grilled lamb chops and baked veggies. I know, I live a good life! Oh, and the P53 photobook arrived from Shutterfly on Friday. Oh the joy! I was in heaven all Friday night, and kept looking through it. I am so glad I decided to do this project. If you still haven't started and if you are on the fence, all I can say is whip that camera out and get started! It looks so delicious and artful at the same time. I know you appreciate his work! How is it possible that you are as thin as you are when you ingest such decadent, divine food? I'd be six pants sizes larger. Well actually, talk to me AFTER the baby is born. I might actually be six pants sizes larger in real life. Bwahahaha! The photography is equally sumptuous. You two are a dream match.